LAKELAND – Rev. Connie DiLeo is used to steadfastly tending a smoldering passion for Christ without ever allowing it to burn out. She first recognized her calling to be a missionary abroad in 1986, when she was a single mother with two young sons attending Aldersgate UMC, Seminole. Although she had leadership roles in her church and went on to pursue ordination, she had to wait until her children were grown to fully respond to her calling. Then she had to jump over more hurdles to establish a ministry in the Dominican Republic. Rev. 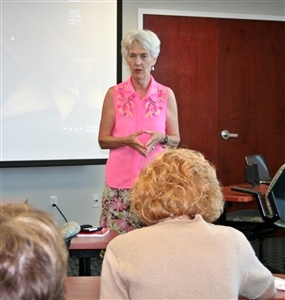 Connie DiLeo shares information about her ministry in the Dominican Republic with Florida Conference staff at the Florida United Methodist Center. Photo by Susan Green. Now, at age 66, as she nears mandatory retirement, DiLeo is asking for prayers that the tiny embers of evangelism burning in the rural village of La Hoya can be fanned into an enduring blaze of Christian worship. “They’re so on fire for the Lord,” DiLeo said, describing a congregation of 15 members that includes 12 young adults. Though off to a vibrant start, DiLeo predicted it will take time to overcome obstacles and build the congregation. The missionary and church planter shared her story this week with Florida Conference staff at the United Methodist Center as she begins a few weeks of itineration in the U.S.
DiLeo spent about nine years as chaplain and project director for Community Partners Association (COPA), a church-supported organization that provides health care and educational services to the small communities of La Hoya and Bombita in the southern region of the Dominican Republic. DiLeo also served as interim director and remains involved in COPA. About three years ago, though, she began meeting and leading worship with a few members of the rural La Hoya community, most of them young adults and of Haitian heritage. DiLeo described friction in the Dominican Republic over Haitian immigrants who come over from their side of the island shared by the two nations. Rev. Connie DiLeo of Florida pastors this new mission of the Evangelical Church of the Dominican Republic. Photos from Connie DiLeo. Rev. Connie DiLeo, far left, and her flock of Christians "on fire for the Lord" in La Hoya, Dominican Republic. 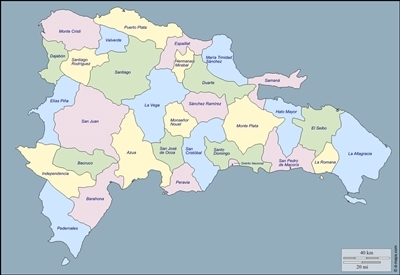 The Baharona province, where missionary Connie DiLeo serves, is shown in pink in the lower left tip of this map of the Dominican Republic. The missionary said her interest in the Dominican Republic initially had been piqued by short mission trips in which she had worked with the native population. However, she has spent much of her ministry working with immigrants, and she has found unexpected rewards. “I fell in love with the Haitian folks,” DiLeo said. In La Hoya, as in much of the nation, people tend to have faith in God but not so much in church institutions. The main church in La Hoya has strict rules, including narrowly drawn guidelines about the musical instruments that can be used in Christian worship, DiLeo said. A young Haitian praise band and a more open style of worship at DiLeo’s church have raised eyebrows. The small group DiLeo began meeting with in a garage was determined to have a church sanctuary, however. 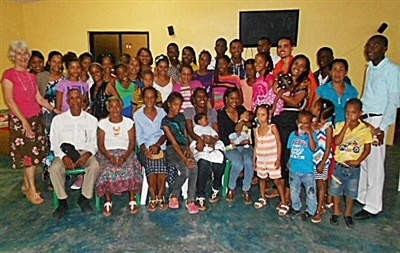 In cooperation with the Evangelical Church of the Dominican Republic and United Methodist Volunteers in Mission, DiLeo began to pursue the project. She traded a work truck to a landowner for two lots in a prime location in La Hoya, and through mission team efforts, a church building went up. “It was a miracle because every time we were about finished with one stage, I’d get a check in the mail or I’d get a (mission) team that wanted to come down,” DiLeo recalled. 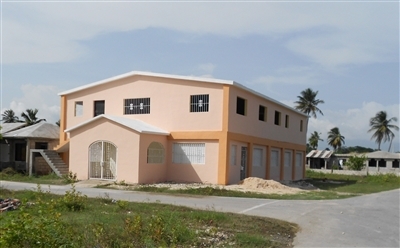 DiLeo said the young congregation has attracted attendance through special programs, a welcoming approach to worship and the music of the young Haitian praise band. An Easter service held outdoors drew a crowd of about 350, she said. Another crowd gathered when DiLeo agreed to preach at a funeral for a young man who was killed in an accident. The family had requested a service by the local Pentecostal minister, who refused, citing the deceased’s lifestyle. A hallmark of DiLeo’s ministry is working with boys to provide activities that keep them off the streets and out of trouble. DiLeo said the young man had briefly attended one of her church’s youth programs. She agreed to conduct the service, both to comfort the family and in the belief that no one could know whether the young man had accepted Jesus in his final moments. Again, the service was held outdoors. “I have never felt more inspired to preach than I did on that street with 150 people,” DiLeo said. The missionary said her ministry’s greatest need is for prayer that Jesus’ disciples in La Hoya will grow strong in their faith and evangelistic spirit. Donations also may be made through the General Board of Global Ministries in the name of Connie Lynn DiLeo, Advance #14169Z. Or click here to make an online donation.